Stunning $50,000 renovation shows like a model. Pristine 4 Bedroom/2 Bath family home with ocean breezes and soothing colors. Minutes to beach, freeways, shopping, dining, schools, hospital, and walking distance to transportation (Coaster). Spacious single story with open floor plan, designer touches, upgrades galore. Entertain in a large living room with a fireplace and a gorgeous gourmet kitchen with granite counters, travertine tile back splash and stainless steel appliances. Dining room opens to view backyard with a large covered patio perfect for relaxing and entertaining. Backyard has plenty of room to add a spa and/or fire pit. All new custom paint, high end laminate wood flooring, porcelain tile, 5 ceiling fans, low e dual pane vinyl windows throughout, can lights in living room and kitchen, newer air conditioner and heater. Two spa inspired new bathrooms. Master suite has walk in shower and hall bath has soaking tub. New landscaping, sprinkler system and shed. Garage has new epoxy floor, workshop and loft. Enjoy paradise in Oceanside. A must see! 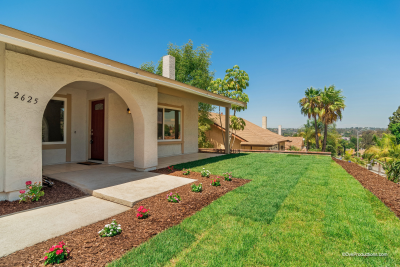 Call listing agent Steve Beller to arrange a showing at (858) 735-2910. Open House Saturday Sept 10, 2016 from 10:00am-1:00pm, and Sunday Sept 11, 2016 from 1:00pm-4:00pm. Features and Upgrades -Spectacular 4BR/2BA complete remodel has it all! -Bright, beautiful family home on a quiet street in College Park Estates. -Open floor plan, soothing colors, many upgrades. -New custom paint, carpet, tile and wood laminate flooring. -Enjoy entertaining in your spacious living and dining rooms and gorgeous kitchen with granite and stainless appliances. -Private covered patio and yard with peaceful view of the hills for relaxing. -New landscaping front and back. -Garage has new epoxy floor, workshop and loft. -A short drive to beach, freeways, schools, and Tri-City Medical. -Walk to shopping, dining, and Coaster! -Enjoy Paradise in Oceanside. A Must See!